When you make content a favorite, you'll be able to access it from all of your workspaces. Favorites are typically the content that you visit most often. 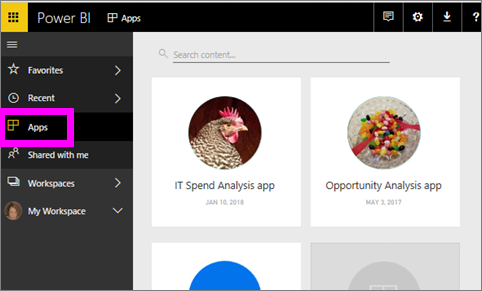 This topic applies to Power BI service, and not to Power BI Desktop. 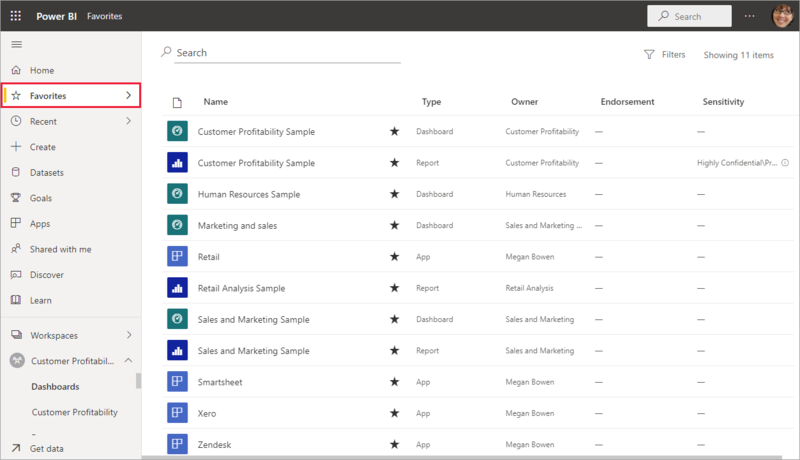 You can also select a single dashboard as a featured dashboard in Power BI service. Watch Amanda add favorites to her workspace, then follow the step-by-step instructions below the video to try it out yourself. Open a dashboard or report that you use often. Even content that has been shared with you can be a favorite. 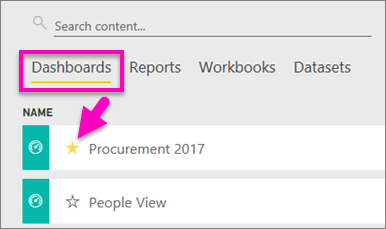 You can also favorite a dashboard or report from your workspace Dashboards or Reports content view tab. From the left navpane, select Apps. Hover over an app to display more detail. 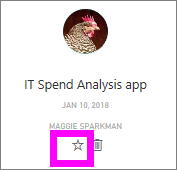 Select the star icon to set as a favorite. To access your favorites, from any workspace, select the flyout arrow to the right of Favorites. From here you can select a favorite to open it. Only five favorites are listed (alphabetically). If you have more than five, select See all to open the favorites screen (see #2, below). To see all the content that you have added as favorites, in the left navpane, select Favorites or the Favorites icon. From here you can take action: open, identify owners, and even share with your colleagues. No longer use a report as often as you used to? You can unfavorite it. 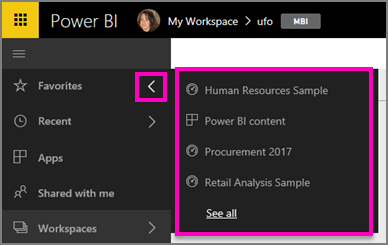 When you unfavorite content, it is removed from your Favorites list but not from Power BI. In the left navigation pane, select Favorites to open the Favorites screen. Select the yellow star next to the content to unfavorite. NOTE: You can also unfavorite a dashboard, report, or app itself. Just open and de-select the yellow icon.